Uber Technologies has agreed on a financial settlement with the daughter and husband of the Arizona woman who was the first person killed by a self-driving car. Elaine Herzberg, 49, was walking her push bike across North Mill Avenue in Tempe, Arizona, where Uber was testing self-driving cars (AVs) with back-up drivers. An Uber AV with a human back-up driver struck Herzberg around 10 p.m. on the night of March 18. Herzberg was severely injured and died shortly after being transported to a local hospital. Uber announced a voluntary pause of all its AV test programs on March 19, and on March 26, Arizona Gov. Doug Ducey (R) told Uber they could no longer test in the state. Because many AV proponents hailed the cars computer driving programs and powerful sensor arrays as superior to human drivers, the fatal accident caused a lot of controversy. Whatever happens next, it won’t see Uber in civil court. The company has settled with Herzberg’s nearest surviving kin, radio station KJZZ reported on the evening of March 28. Elaine Herzberg was crossing the road about 100 feet from a warning sign that asked pedestrians to only cross the road at the crosswalk. Herzberg appeared oblivious to the oncoming car until it was only about fifty feet away, revealed dashcam footage from the self-driving car before and after it made impact. Even though she was jaywalking, the road where she was crossing was five lanes wide. The driver and the AV’s sensors should have noticed and identified the fact that there was a pedestrian in the roadway. Video of the incident show that while Herzberg was apparently not aware of the oncoming car, the human back-up driver was watching the computer monitor in the car, and didn’t see Herzberg either. The car, equipped with a 360-degree Lidar system (radar using laser, instead of radio) should have been able to spot Herzberg easily, says Marta Thoma Hall, president of Velodyne Lidar Inc., which supplies Lidar to AV car companies. “We are as baffled as anyone else,” Thoma Hall told Bloomberg Technology. “Certainly, our Lidar is capable of clearly imaging Elaine and her bicycle in this situation. 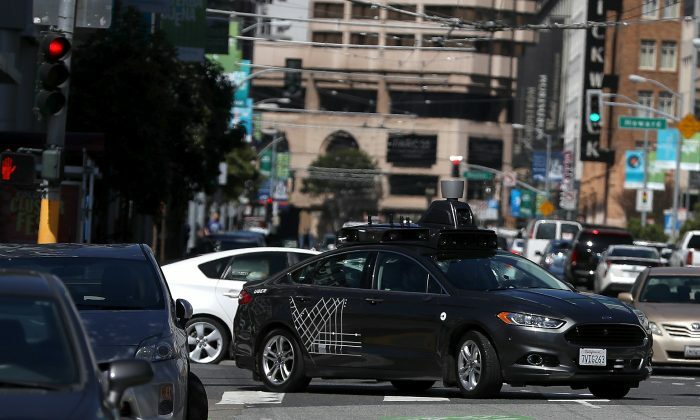 However, either the Lidar did not detect Herzberg – who was pushing a bicycle festooned with grocery bags – or Uber’s logic circuits failed to register the pedestrian’s presence. In any case, the car’s autonomous driving system made no reaction whatsoever, plowing into the hapless Herzberg at an undiminished 38 mph, without the slightest hint of braking or swerving. The on-board human driver was so busy monitoring computer read-outs, she didn’t see Herzberg until an instant before the collision. Despite the collision and the questions it has raised about the safety of certain AV control systems, Arizona Governor Doug Ducey has shown no desire to make his state less friendly to AV firms. The governor told reporters on the afternoon of March 28 that he still supported AVs as a way to make roads and highways safer, AP reported. Because the businesses are almost unregulated and unmonitored, all the major AV firms — Google’s Waymo, GM’s Cruise, Intel Corporation, and Uber — set up shop in the greater Phoenix area. Waymo is already testing driverless taxis on the streets of Chandler, a Phoenix suburb.